in it to inspire you and create something in a vintage/shabby chic style telling us in your post how you found inspiration from the picture. 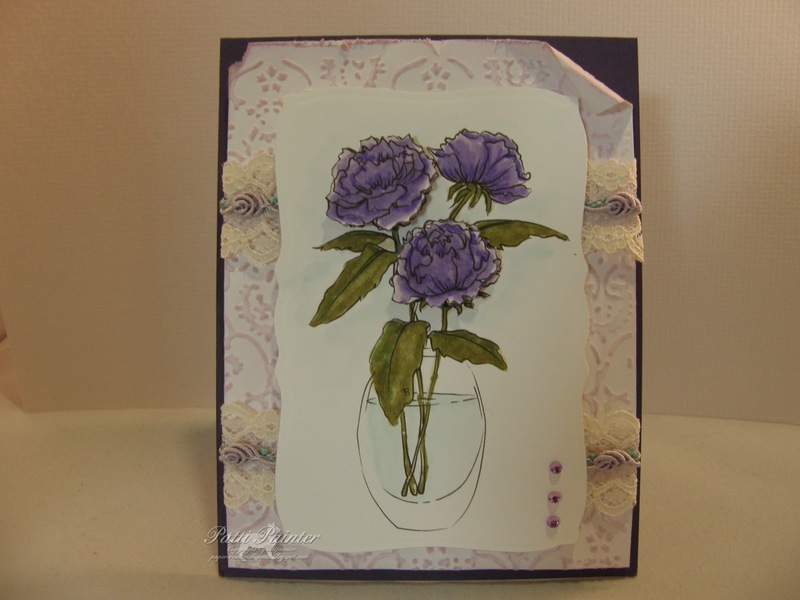 I love the purple colors, vase and ruffles of the flower, so I immediately thought of the "peonies in a vase" image from Beccy's Place which I colored with my Spectrum Noir markers. I printed two of these, hand cutting a couple of the flowers which I placed on foam dots for some dimension. some of that gorgeous floral lace trim from a local fabric outlet. I also used a single peony image from Beccy's Place for the inside. For a chance to win a digital image from us this week, stop by at SCH for all the details, some inspiration from my teammates and get started on your card. Happy Day all, I am off to a shooting tournament, so I will see you soon. Looks beautiful Patti, love the blooms. Beautiful Patti, love the flowers and your wonderful colouring! Those flowers are just gorgeous, Patti! Please get in touch with me through email (plumroselane@gmail.com) so I can give you the new code for your signature. Check out my blog if you have any questions. Hope all else is great! This is beautiful, love how you did the inside. Love these beautiful flowers and your coloring is amazing. Have fun shooting. 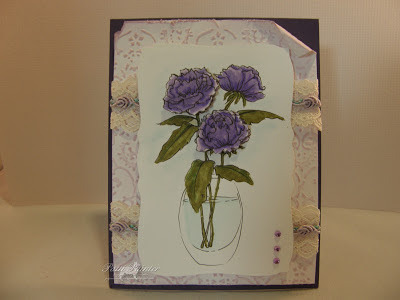 sorry I have been late commenting, having computer problems, hope to get the new one up and going today, your card is gorgeous, love the lace you used too!!!! This is simply lovely. Beautiful color and stunning design. Very, very nicely done. Love your flowers Patti!! Perfect color for our challenge!! Again..love the inside too!! Beautiful design and fabulous coloring Patti! 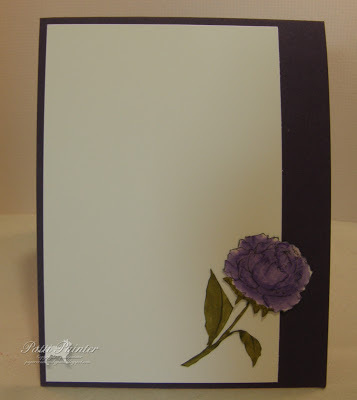 Lovely card - inside and out. Patti so pretty love the way you colored your image and the turned corner..gives me ideas!!! Gorgeous Patti... I love the way you've coloured the peonies and I love your choice of colour too. They look wonderful popped up like that and it's nice to see you've finished the inside with a repeat of the pattern. Well done!